I first became aware of organist Charles Kynard a long time ago, when listening to a Tom Waits record, Blue Valentines. Greasy, sharp-as-a-knife organ injections were the cherries on top of Romeo Is Bleeding, one of that jazzy, theatrical shuffles that the incomparable growler and storyteller Tom Waits brings with so much zest. Ever quick to scroll through sleeve info, I bumped into the name of Kynard. My mind went elsewhere, as minds often have the inkling to do. Yet, Kynard had stayed in the back of my mind and when I started digging organ jazz of the likes of Jimmy Smith, Don Patterson and Lonnie Smith, out of the ditch climbed Kynard as well. What I learned is that the fact that Kynard did a Waits date is part of the proof that the organist’s nature was ambidextrous. Kynard is best known for his groovy funk and blues recordings on Prestige and Mainstream. But he also was a regular attributor to Hollywood productions and played gospel in church as well. 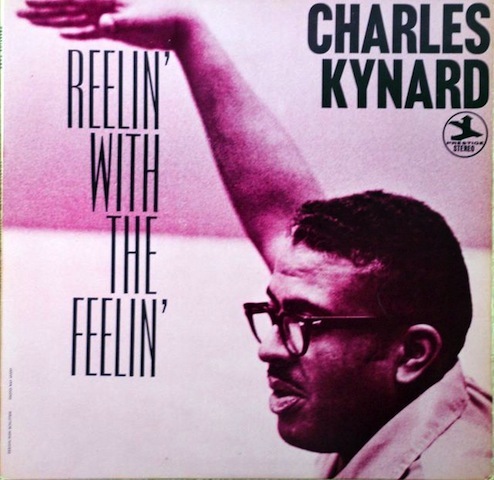 Reelin’ With The Feelin’ is Kynard’s third release on Prestige and a fitting example of his blues and soul jazz personality. It has an interesting line-up including guitarist Joe Pass – not often heard in such surroundings – The Jazz Crusaders’ tenorist Wilton Felder and ace studio bassist, Carol Kaye. Re-listening this album only for Kaye’s delicious dry, plucky sound and articulate style, is, as I now know for a fact, a far from weird effort, but on the contrary, very worthwhile. The three longest cuts of the album – Reelin’ With The Feelin’, Slow Burn and Boogalooin’ – written by arranger Richard Fritz, are fresh funkblues jams. Slow Burn is the highlight. The tight rhythm consisting of tacky drums and a rumbling bass figure so deep it makes you wonder how deep the ocean is in Carol Kaye’s mind, sets things in motion. From then on things are hard to pull to a stop. Kynard builds his solo well, veering from crunchy bass notes to burning rubber-phrases in the upper register. Felder puts in a yearning statement and throws in squeaky and honky twists. Joe Pass produces a mix of funky licks and fast, tricky phrases that travel beyond the confines of the pentatonic blues format. Ever thus, Slow Burn has to come to an end, and it does with a humorous stretch of notes by Kynard. Predictably, Carol Kaye’s Soul Reggae is a reggae-type tune. It’s a charming ditty that bounces along merrily. Is Kaye the first to incorporate reggae into a jazz format? She might well be. In 1969, reggae wasn’t as yet the big thing it would become when Bob Marley got into the picture. Be My Love is a nice Latin tune. Kynard’s solo is a throat grabber, containing swift, fiery and freewheelin’ phrases, occasional outbursts and repeated r&b attacks. Stomp, written by Wilton Felder, is a variation of Dizzy Gillespie’s Blue ‘n’ Boogie. The drums fail to swing, but the immaculate unisono figures each couple plays behind the given soloist give it the necessary bite. As you may have noticed, Kynard didn’t bring any tunes to this session. You’ll hear, however, that it doesn’t effect the very pleasant and funky proceedings. Charles Kynard’s date with Tom Waits took place in 1978. He died on July 8, 1979. There’s no such thing as an appropriate passing, but Kynard’s comes close. He died while playing his home organ.